the Radiohead fan community on AtEaseWeb has put together a two-hour, multi-camera concert video of the art-rockers’ entire September 29, 2011, gig. The band has blessed the project by providing its own soundboard audio. The effort is dedicated to the late Radiohead drum tech Scott Johnson, who died during an awful stage collapse in Toronto this year. Following their sell out Shows in Dublin this summer, Bruce Springsteen and the E Street Band have confirmed they will return to these shores in July 2013 for 3 special nights around the country in Limerick, Cork and Belfast. Tickets go on sale Thursday 6 December at 9am. The announcement that the Wrecking Ball Tour is extending into 2013 comes as the tour is awarded ‘Top Draw’ by Billboard Magazine for having the top attendance out of any other tour in 2012. The Album Wrecking Ball released earlier this year became Springsteen’s tenth No.1 Album in the US as well as topping the charts all across Europe including the UK and Ireland. This was a gig that I’d been looking forward to for quite some time. 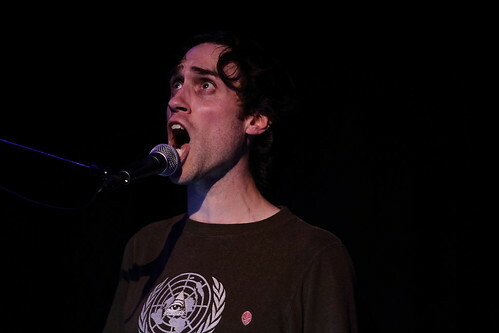 Beardyman (A.K.A. Darren Foreman) has quickly garnered a reputation as an incredible live performer. His unique beatbox skills and use of live loops threatened to throw up one of the most interesting nights of the year. The show was a sell-out and and I honestly can’t remember the last time I saw the place so rammed. Local boy Brian Deady got things off to a pleasant start by throwing out some quality tracks that got the thickening crowd nicely warmed up. Then, at around the half past ten mark, the main act took to the stage and the place erupted. This was a crowd that were here to see Beardyman and they were deafening in their appreciation. He took the applause and worked the crowd to perfection, with banter aplenty throughout the set. Things on the night could be best described as eclectic, but that only tells half the story. As Beardyman put it himself, he was coming up with the rhymes “off the top of his head” but it certainly didn’t show. There were loops galore and the beatboxer from Brighton didn’t disappoint with creativity being key. We got his unique acapella take on everything fromWhole Lotta Love (morphed into an appreciation for weed) to The Korgi’s Everybody’s Gotta Learn Sometimes. There really was a hell of a lot to take in here with ideas coming thick and heavy. Just when you thought you were on terra firma, the wild-eyed man with the mic took things in a completely different direction. One second you were listening to him doing a Madonna pastiche courtesy of the Bangles and next thing you were into a furious 10 minutes of Dubstep meets dancehall. To some, that might sound like a horrific mix but incredibly it worked. If you wanted to see something that was unique and original then this was definitely one for you. I can genuinely say I’ve never seen an act quite like it. The fact that every sound emanating from the stage came courtesy of Beardyman made this a performance that was all the more exciting. He certainly makes it look easy as he darts from one genre to another with seemingly effortless ease, this was almost performance art with a beat. He certainly lifted the roof off The Pavilion and the capacity crowd were left breathless and panting for more by the end of his set. To put it simply, Beardyman came, Beardyman saw and Beardyman most definitely conquered. Everybody’s favey shiney Scotchland songsmiths have released the video for their new track “Dead Now” and do you know what, its very pleasant indeed. The song is taken from their forthcoming longplayer ‘Pedestrian Verse’ coming February 2013. Full line-up confirmed, details of RTÉ Two Live TV broadcast from Other Voices on Sunday December 2nd announced! BANTER guests unveiled and Other Voices Dingle Music Trail revealed! Other Voices season gets into full swing in the coming weeks, as further details of the TV music event are unveiled. The renowned music recordings show will take place in front of a live audience in St. James’ Church, Dingle, Co. Kerry on Saturday December 1st, Sunday December 2nd and Monday December 3rd, with the IMRO Other Room closed recording session taking place on Friday November 30th. While the day-to-day line-up has yet to be revealed, almost all of the artists performing at St. James’ Church over the three day music extravaganza have been confirmed: Aaron Dessner (The National), Kodaline, Local Natives, Luluc, Owen Pallet, Palma Violets, Paul Buchanan, SOAK, The Staves, The Strypes, The Unthanks, This Is The Kit and Villagers. The IMRO Other Room artists, as well as the Other Voices Viewer’s Choice nominees, will be announced shortly. This year’s Other Voices Music Trail will feature artists performing at the Church and the IMRO Other Room, as well as many Irish acts including Daithi O’Dronai, Toy Soldier, Neon Wolf, Mick Heslin and In The Willows. Following the Dingle recordings, Other Voices will head north in February 2013 for a three day residency at Glassworks in Derry-Londonderry on February 8th, 9th and 10th, celebrating the city’s eminent status as UK Capital of Culture 2013. Already announced for the Derry-Londonderry leg of the three part musical journey are Marina and The Diamonds, Django Django, Neil Hannon and Jesca Hoop. Villagers new video for the track Nothing Arrived premieres today on VEVO. Directed by Alden Volney the video documents a day in the life of one Terrence Bliss – a lonely office worker whose repetitive existence is momentarily disturbed. Sad news thatCork’s homegrown ukulele masters, The West Cork Ukulele Orchestra are calling it a day. They will play their final gig at Cork Opera House on 2nd of December 2012 for a night of joyous, bounce inducing happiness and to say a tearful goodbye to their fans from far and wide! 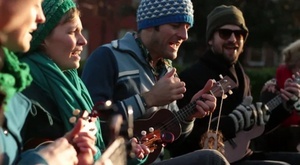 Leapfrogging over barriers of genre, time and taste, the West Cork Ukulele Orchestra is comprised of nine disparate musical talents, brought together for one purpose: to rock the planet, ukulele-style! They will plunder the last 60 years musical awesomeness to put a rip-roaring show full of lush harmonies and death-defying ukulele-playing. The Franks release the video for their new single ” That’s Life”. It’s the third single from their current album “Greenwich Mean Time”. It’s a lovely track with a video that incorporates footage from the lads recent tour of Japan. Well worth a look.